Located in bustling Zhongshan Commerical District in Taipei City, Taipei, Yo Yo Regency provides delightful accommodations with convenience in transportation to major Taipei commercial and leisure stops. The hotel is about a 5-10-minute walk away from MRT Zhongshan Station and MRT Shuanglian Station allowing guests to explore Taipei attractions such as Taipei Story House, Taipei Fine Arts Museum, Shilin Night Market, National Palace Museum in short MRT rides. For guests connecting to other countries and Taiwan cities, the Taiwan Taoyuan International Airport is reachable in a 50 minute ride, the Taipei (Songshan) International Airport can be accessed in a 15 minute ride, while the Taipei Main Station and Taipei Bus Station are just 15 minutes away for your to enjoy an easy Taiwan travel. Situated in a bustling area in Taipei City, this Taiwan business hotel is also nearby Shin Shin Cinema, Taipei Wedding Street, exotic restaurants, and a number of boutique brands such as Gucci, Louis Vuitton, Armani and more. 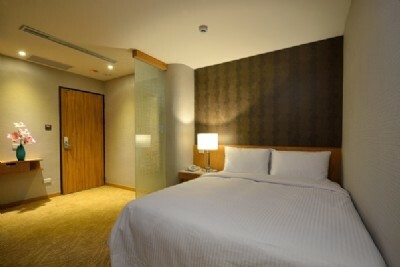 With a wonderful location in Taipei, Yo Yo Regency is a nice accommodation choice for your days in Taipei. TWD 500 for additional guest sharing existing bed. Charge to be paid upon check-in.